One of my lovely friends has a lime tree and she very kindly gave me a bucketful of limes, which is a real treat as they cost an arm and a leg in the shops. So the only thing to be done was to set about baking, and a light citrus tea cake with Chantilly cream seemed the perfect treat for Mother’s Day. I had a beautiful Mother’s Day, although it always has it’s bittersweet moments having lost my own mother at a very young age. This year my niece celebrated her first Mother’s Day and as is the case every year, Mother’s Day falls on her mother’s birthday, my sister. Except that my beautiful sister wasn’t here to spend the day with her first grandbaby, celebrating her daughter recently becoming a mum. She sadly succumbed to MS back in 2010 at the tender age of 40 and oh how I miss her still, and the moments of wanting to share a memory, a laugh, or even a cry fade, but never seem to go away. She would have been besotted with her daughter’s child and my heart aches while clearly imagining how happy and proud she would have been. But if there’s one thing I’ve learned in my lifetime, it’s that life isn’t kind or fair. It is raw and filled with emotions and experiences that shape us into the people that we are. And what makes a mother? Do you have to have physically given birth to be known as a mother? What of those who have carried a baby but lost it during pregnancy? What of those who have given birth but the baby hasn’t survived? And what of those who have never held their own child but are involved with children through teaching and would have been amazing mothers? What defines a mother? My life definitely changed for the better when I became a mother. All of a sudden things that hadn’t seemed important, or I could imagine but hadn’t yet experienced, became real and there was this human I had created who was totally 100% dependent on me for everything. Your focus shifts, priorities change overnight, your heart is very suddenly alive outside your body and the fear and joy you feel is hard to describe. My life hasn’t quite turned out how I imagined it would. I thought I’d have a hoard of children in a very busy home and while being a stay-at-home-mum, I’d have everything under control and be gorgeous, and they’d be gorgeous and then you realise that life doesn’t always work to plan. I’m a working mum in a very busy home and we’re not always gorgeous and under control. I sometimes feel guilty for having lost 3 babies. Like I let them down by not being able to carry them to term and bring them into this world; into my family. I definitely feel guilty for not giving my son any siblings and I’m sad when I know I’ll never have that big family gathering photo where my husband and I are surrounded by our children and their many children. But then I stop myself, because I am so very blessed to be my son’s mum. I’m the only one he’s got and I get to enjoy and savour every one of his life stages as there is no-one else to take my focus away. His firsts are always my firsts; and by the same token, every stage that he outgrows, there’s a tiny part of me that bids a sad farewell as there is no no. 2 to watch on their journey. He is my sunshine and I will continue to be the best mum to him that I can possibly be. So to my sister, my niece, my mother and step-mother; to all my friends who are mothers and to every mother out there who gives of herself daily – yes it can be tiring, downright exhausting at times, and things very definitely do not always go to plan, but you are the only mum that your little humans will ever have. Be kind to yourselves, celebrate yourselves and the gift of Motherhood that you’ve been given. It is a calling that truly defines generations. 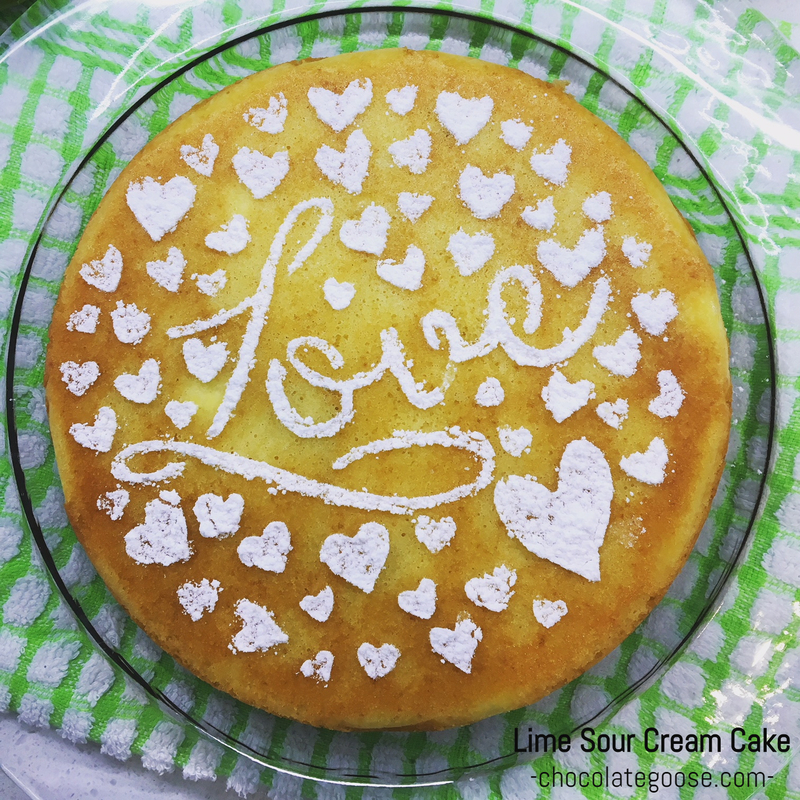 And treat yourselves to a little Lime Sour Cream Cake once in a while. Who cares if it goes to the hips. It’s just more of a reason to run around, chase, play with and cuddle your babies. I hope you all felt special this Mother’s Day and set aside the guilt or heart-ache and celebrated being someone’s Mum. Preheat the oven to 160°C and grease and line a 20 cm round cake tin. Beat the butter, lime rind, sugar and eggs together until they are light and fluffy. Try not to get any lime juice into the mixture as it will separate. If this happens, don’t worry, it might look odd but the cake will still come together beautifully. In a separate bowl, sift the flour and baking powder, then fold through the egg mixture alternatively with the sour cream, mixing until smooth. Pour the mixture into the prepared cake tin and bake for 45 minutes or until the cake springs back when pressed gently in the centre. Leave it to cool in the tin for about 10 minutes before turning it onto a cake rack to cool completely. When cold, dust with the icing sugar or serve with Chantilly cream. Beat the cream, vanilla extract and icing sugar together until soft peaks form when you slowly lift the beater out of the mixture. The tops of the peaks should gently fall over. 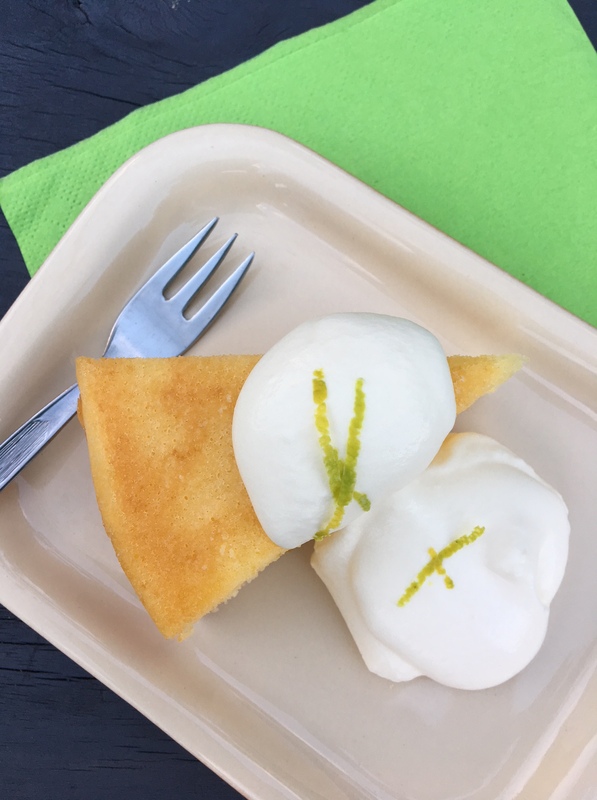 Serve a dollop of cream with the cake and enjoy!